Here’s an update about the weblog activities surrounding the non-western dance program at ZXZW! April 30th edition was cancelled due to the attack in Apeldoorn that same day, and moved to May 5th, Liberation Day in The Netherlands. Be there, it’ll be a huge party! 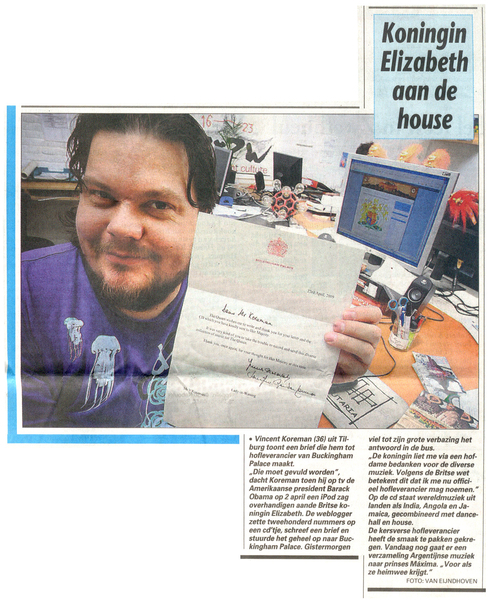 This morning, when you were reading the best and biggest newspaper of The Netherlands, De Telegraaf, you could have seen Vince on page 3. There was a photo and a bit of text on the letter he got from the British Queen (we told you yesterday about it, do you remember?). Also, when you were still asleep, Vince was called in the radio show of Giel Beelen on 3FM. Check it out here later today. The phonecall is in the 3rd our. Cumbia’s the next big thing! For the best new music, always check Generationbass.com, you’ll love it! Generation bass: Cool parties with hot music and smoking dance programme at ZXZW 2009. But it is most visible as a weblog that keeps on attracting lots and lots of people interested in sunny beats. Hey guys & girls, we are expecting our 50.000th visitor today to GENERATION BASS!!! yeah! Not bad for a blog that’s been online for about 2 months! If we were an artist in Holland we’d get a gold records now So leave comments! I’ll try to determine who is the 50.000th and he/she will get a special prize. Not only a shirt, cd’s and other goodies, but also a special REMIX for you by SONIDO DEL PRINCIPE. You choose the song and you will become THE OWNER of the remix. You can decide what you want to do with it, it’s all on you baby! This remix will not be posted here (unless you want to) but can also go on your own blog/profile/whatever exclusively… So leave a comment when you drop in and WIN WIN WIN! On this years ‘Koninginnenacht’, the Dutch expression for the evening before April 30th the date our former queen was born, there will be a very cool party in Tilburg, and we are giving away tickets, so YOU can be there too! The line-up includes AC Slater, DMDN and Rebel Up! Soundsystem. 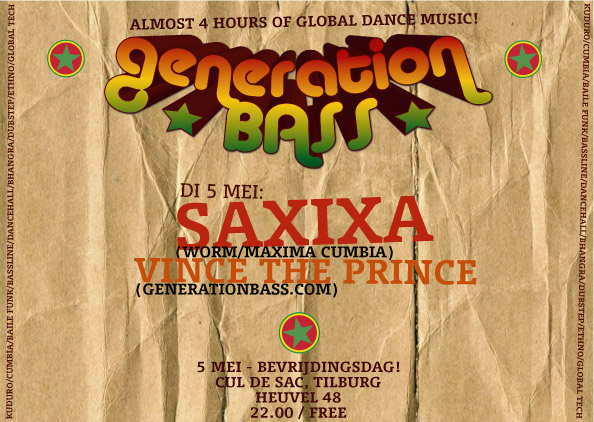 We give away 3×2 tickets for Generation Bass-A-Thon Day 1 on April 29th in 013 Tilburg! All you have to do: send an e-mail to win AT zxzw DOT nl and the first three contestants will win two tickets! Piracy is the new creativity. Influential DJ, producer, and label head Jace Clayton digs deep into the world of digital cumbia bootlegs to find gold. Since his mixtape heard ’round the world, Gold Teeth Thief, dropped in 2001, Clayton (a.k.a. DJ /rupture) has become well-known for telling us what we should be listening to. For the past couple years, he’s been knee-deep in cumbia and Latin beats. At this short XLR8R film he teaches us about cumbia and takes us to bootleg CD shops in San Francisco’s Mission District to sort the wheat from the chaff—hardly an easy feat in the world of digital piracy. Download this mix (via Generation Bass) for free and feel the summerbreeze pumping out of your speakers. 07. El Norte vs SDP – Wu-umbia!